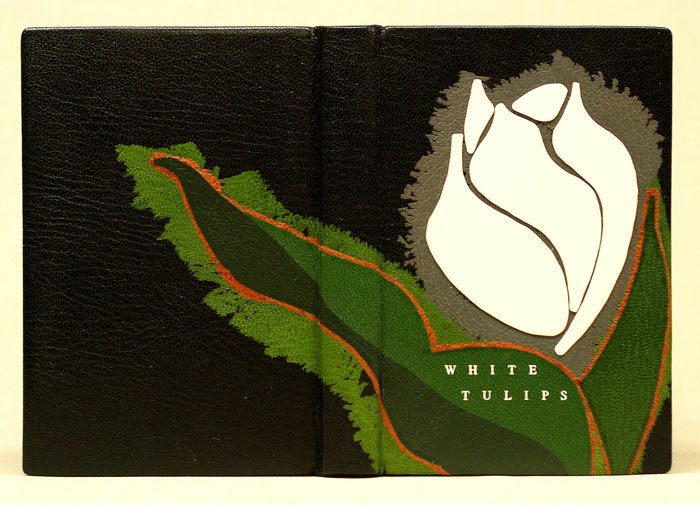 The completed design binding for White Tulips. White Tulips was designed, typeset, printed and bound by hand in an addition of 30 in 2003 by my good friend Leonard Seastone of The Tideline Press. This copy, numbered AP (Artist’s Proof), remained in sheets, unbound. Since most of my design bindings are commissions, I generally first work up a set of sketches of binding ideas to share with the client. Some clients actively take part in the design process so the work becomes something of a collaboration, while others pretty much leave me on my own to proceed as I see fit. In either case, though, the design and techniques to be used have been thoroughly worked out ahead of time leaving only minor adjustments to be made as needed in the creation of the actual binding. For this book, however, I wanted to approach the process more in a more ‘painterly’ fashion allowing it to take shape in its own time and its own way. I began as I always do by reading the book. I was especially alert to see if any images other than white tulips suggested themselves. While the haiku are visually evocative, in the end the title of the collection proved overwhelming. It did not seem to make sense to use any other image except a white tulip. I made a quick sketch with pencil and marker, the basic idea was done and I chose the colors. White for the tulip, of course, and green for the leaves, but each with a halo of additional color and a ground of black goat skin. The titling I envisioned in white, rather than the usual gold, with the author on the back cover and the book title on the front. You’ll see later, though, that this was changed on the book from my original conception as the work progressed. As is generally the case with my bindings, I design the piece to work visually with the book open, viewing the spread of the back board, spine and front board as a single unified image, as well as with the book closed viewing each panel separately. The title page opening is a double gate-fold, being four pages wide rather than only two as in an ordinary book. With the basic exterior design chosen, I turned by attention to the preparation of the text. 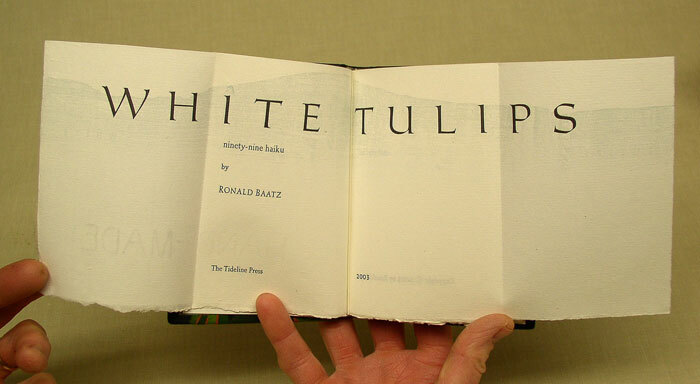 White Tulips was designed by Leonard as a ‘gate-fold’ book. 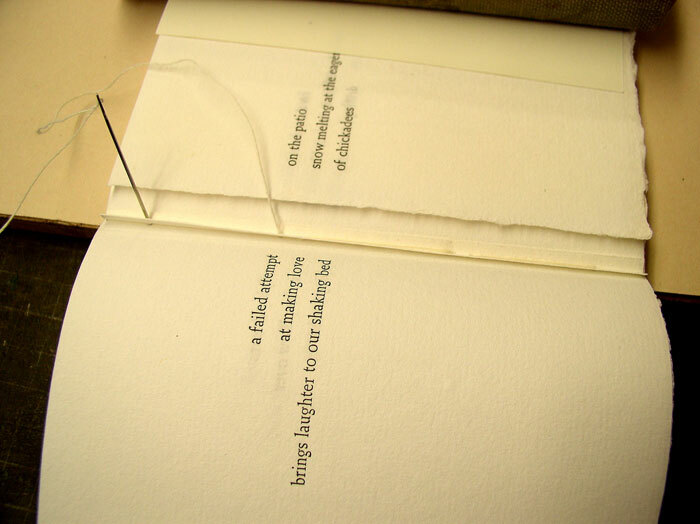 The pages open from the spine as usual, but in addition, alternate pages open out from the fore-edge as well, so an open spread is three pages across rather than the usual two. This creates additional swelling at the fore-edge making it thicker than the spine, so compensatory tabs had to be sewn in at the spine to prevent the splaying of the boards. In a similar manner, any book of folding plates or maps needs similar compensation at the spine to prevent the same problem. An endpaper section was made up of the same vintage Barcham Green paper on which the book was printed. A flexi-flyleaf was made of a sandwich of a translucent gray-green Japanese paper and black Ingres tipped only at the fore-edge to the white Barcham Green yielding a sheet with a soft drape rather than having the stiffness of a made endpaper where the flyleaf is fully pasted to the white stock. Given the book’s small size (5 3/8” x 3 ¼”) this seems more appropriate. 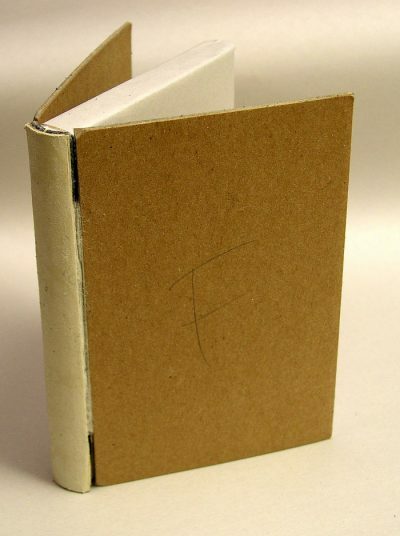 A leather hinge of the same black leather as would cover the book serves as the inner joint. The flexi-endsheet is a sandwich construction of three layers of paper–a white sheet matching the text, a Japanese hand-made gray-green sheet, and an inner black sheet to darken the color of the translucent Japanese sheet. The three are only tipped at the fore-edge rather than being glued all-over. 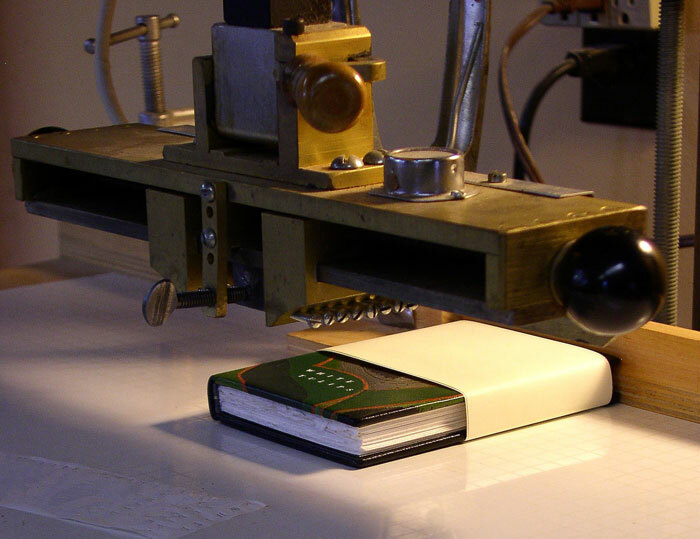 The sewing in progress, showing the one-quarter-inch-wide compensation tab to bulk up the spine to the same width as the folded fore-edge. Often for a design binding I color the edges of the text block in a way that includes it in the overall design. Here I did not. With the gate-folds at the fore-edge and the original deckles of the handmade sheets left at the tail I thought that coloring it would make more of a mess than a contribution. And as the color ‘white’ was inherent in the book, the whiteness of the textblock edge already made its contribution to the design. 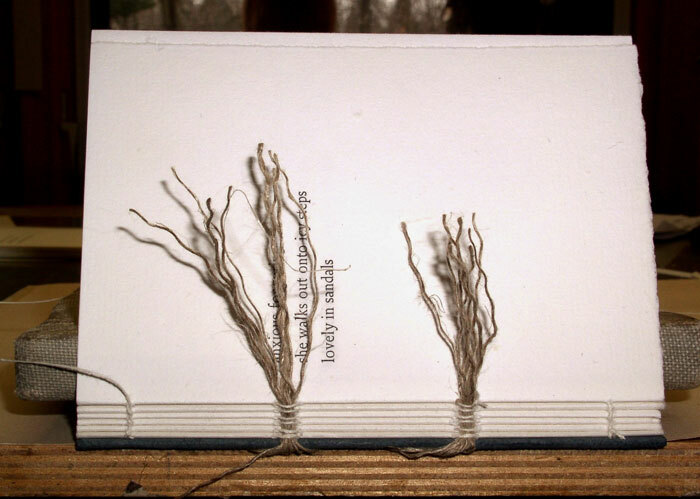 The book is sewn on frayed linen cords. The boards and a hollow spine tube have been applied to the sewn text. The signatures together with the compensatory tabs were sewn onto frayed linen cords. After being rounded and backed in the usual fashion, headbands of gray silk with a pale green stripe were sewn at the head and tail. Boards for the front and rear were prepared by slightly beveling the edges and rounding off the sharp corners all to soften the look and feel of the finished book. The boards and a hollow spine tube were affixed. Ready for covering, it was time to turn my attention back to the materials for the outside. 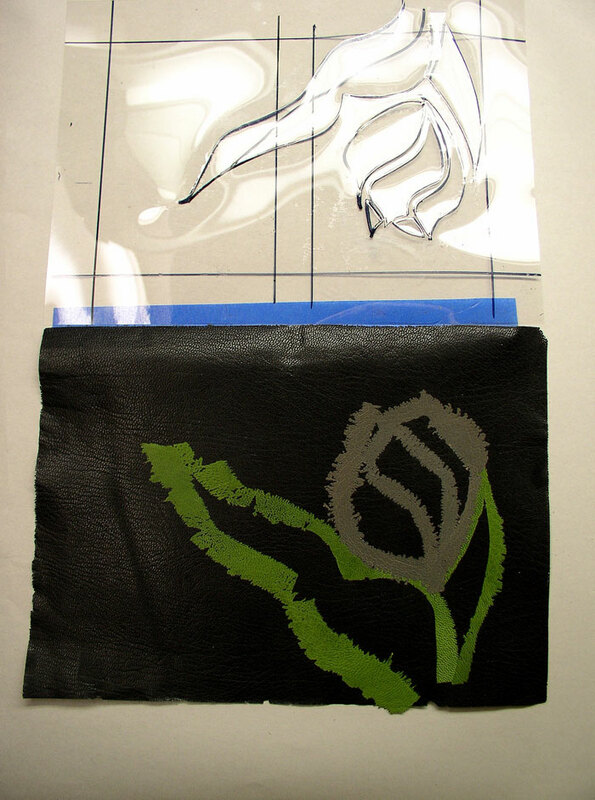 The sketch was transferred to a sheet of mylar which was then hinged to the base leather. The base, black goat was cut and pared as usual. 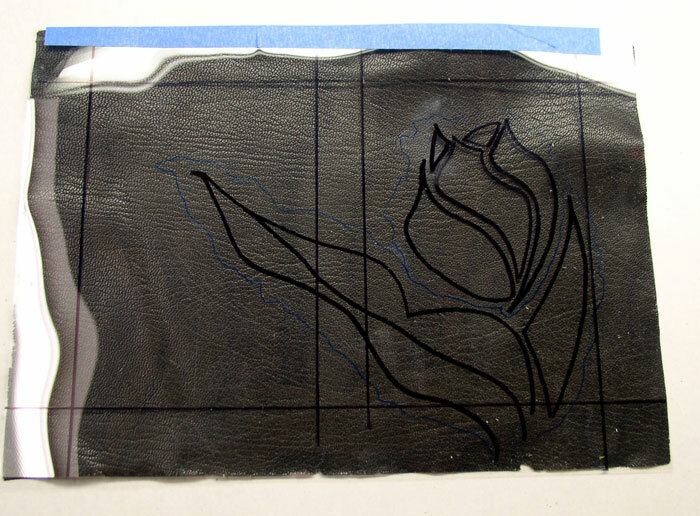 The pencil sketch for the tulip was refined slightly and traced onto a piece of mylar, which was hinged to the top of the leather with blue, low-tack painter’s tape. 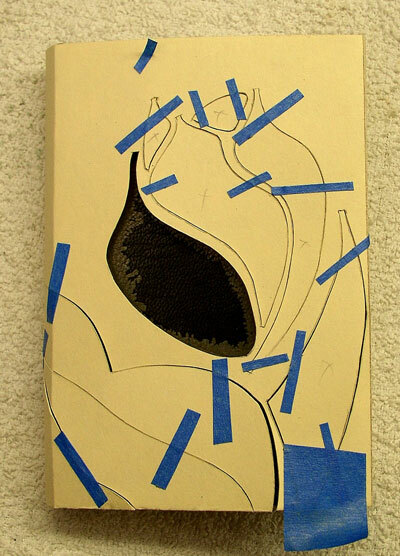 This allowed me to use the sketch as a guide for placing the initial colors of the design onto the black leather, checking their position by flipping the sketch back and forth. 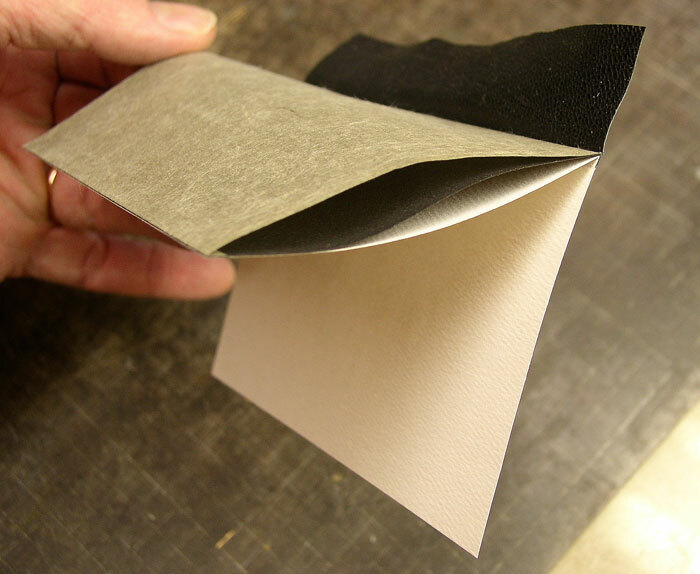 Tape applied to the back of the leather allows a thin feathered onlay to be made. 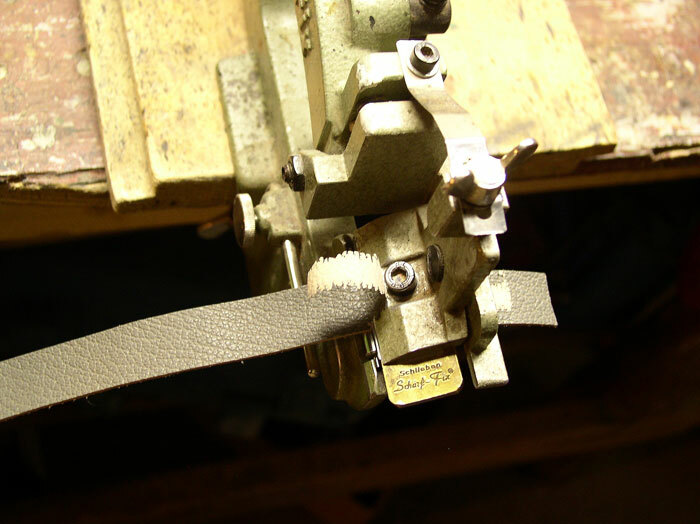 The prepared leather is drawn through the Scharf-Fix. 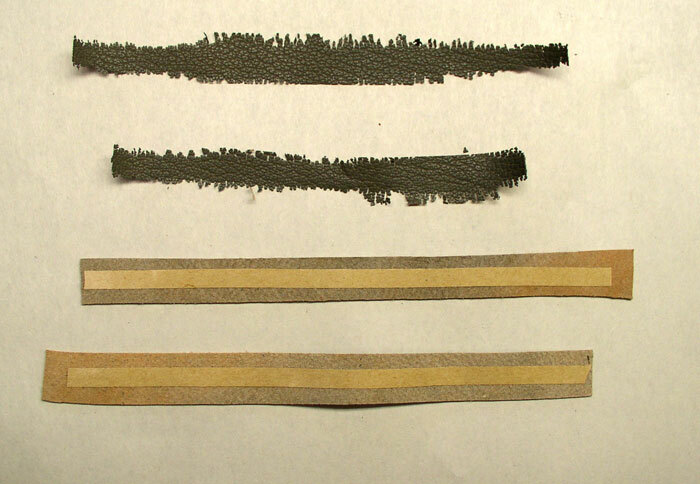 The area over the tape, being slightly thicker than the surrounding leather, is slice off thinly. Feathered onlays for the halos around the leaves and flower were prepared by placing a piece of tape on the rear of the chosen leather. 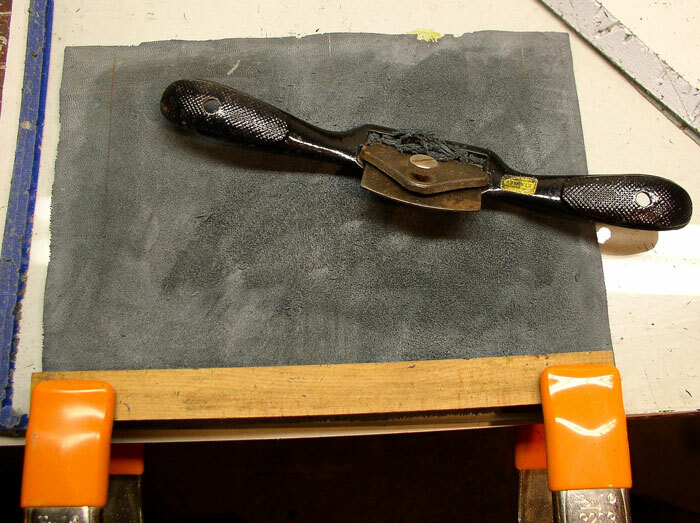 When it was pulled through the Scharf-Fix (a device generally used for edge-paring the leather to thin it enough to gracefully fold around the board) with the leather surface turned towards the blade, a thin strip of leather was produce with an agreeably fuzzy edge. Using the mylar sketch as a guide, the leather onlays for the halos were glued to the black base leather. The feathered onlays have been glued to the base leather with the aid of the mylar sketch. When all the pieces were in position, the leather was flipped over, clamped to the workbench and pared from the back side using a spoke shave. This removed the raised areas of the base leather where the onlays had been glued allowing them to sit flush with the surface of the base leather once it is glued onto the book. After the feathered onlays have been applied, the back of the base leather was pared with a spokeshave. 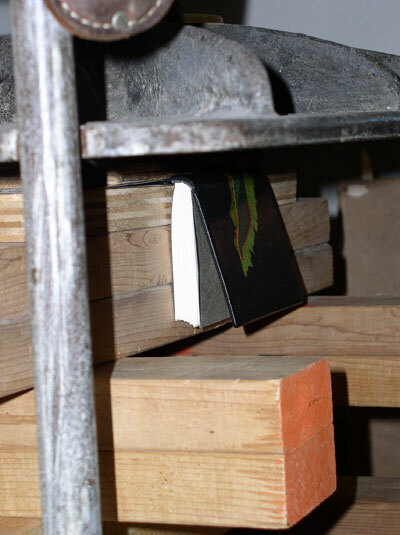 The base leather was then applied to the book in the usual matter. 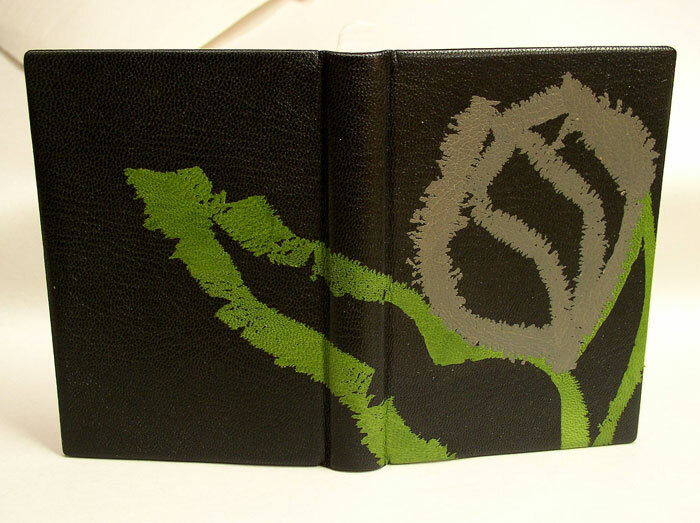 The base leather has been applied to the book. While that was drying, I made a wrapper of bristol on which I had traced the original drawing. Each piece was cut out, but held in place by a couple of bits of blue, low tack painter’s tape. 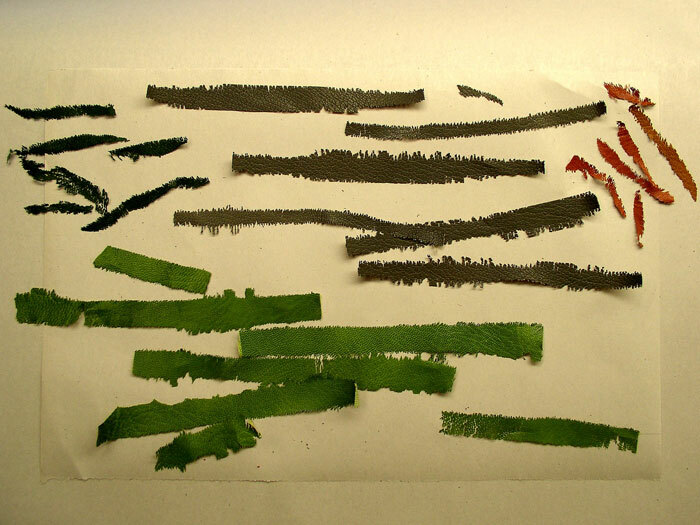 For the leaves, these would become the templates for cutting the various green leaves. For the white tulip, the index pieces themselves were wrapped in white leather. The sketch is transferred to a wrapper made of bristol. 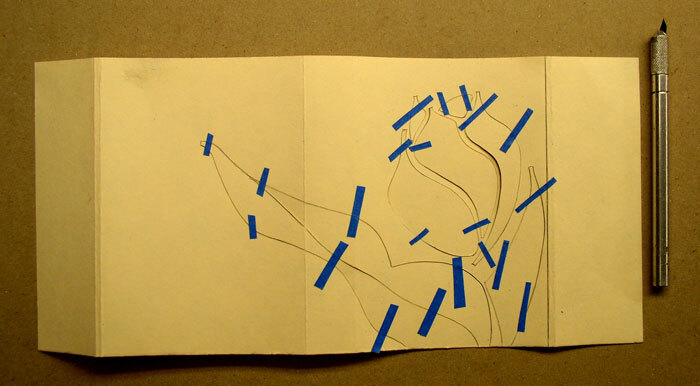 The shapes are cut out to use as templates for cutting the leather and to aid in their placement on the book. The bristol wrapper is taped to the book to act as a template for placement of the onlays. Loosely laying the green leaves in position it became apparent that the design was too monochromatic and the leaves got lost in the background. To make them jump out and to add to extra color interest a thin orange feathered only was applied to the edges of the leaves to provide a second halo. Then the leave pieces were glued to the surface of the covers, using the bristol wrapper as a guide for proper placement. In the end, the wrapper idea didn’t work out very well because it was difficult to stabilize it in position. Cutting the bristol into three separate pieces—front cover, rear cover and spine—better allows them to be firmly fixed in position providing more accurate guidance for placement of the onlays. The prepared onlays. 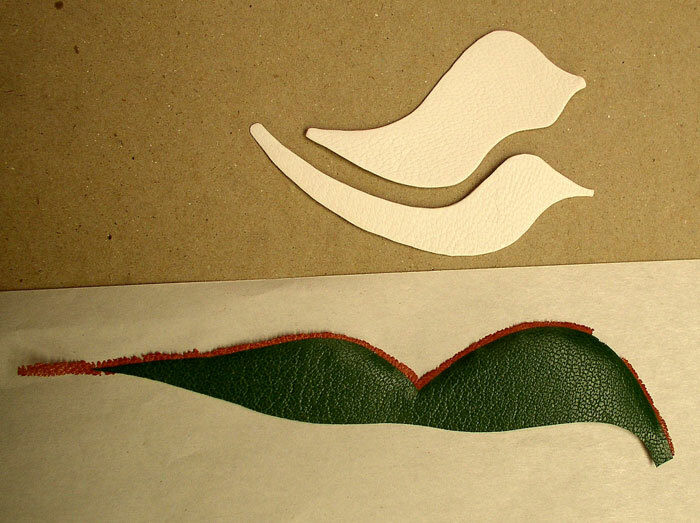 Above, the white leather for the blossom is wrapped around the bristol to make a raised onlay. Below, the bristol was used as a template for cutting the leaf shape. After the leaves had dried for a few days, each board was individually heavily pressed between two stainless steel sheets. The heavy pressure between smooth metal helped to further sink onlays into the black base layer. After the onlays were applied and dried, the boards were individually pressed between stainless steel plates. When the pressing was complete, the tulip petals were glued into place. By wrapping the cut pieces of bristol in the white leather, a subtle bas-relief effect was achieved as they stand proud of the boards in contrast to the other colors. The title is stamped in the stamping press. The type was set for the title and author, and I experimented with their placement. In the end I chose to eliminate the author’s name (sorry Ronald), and moved the title directly under the tulip rather than across the top as I originally planned. 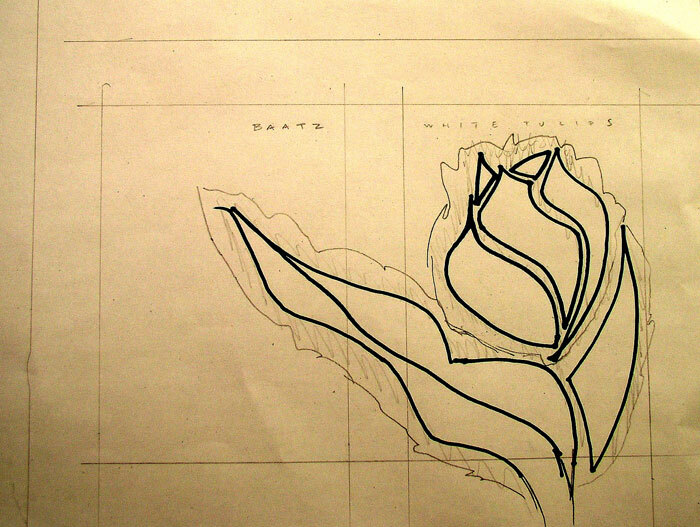 This left the tulip as the most prominent design element, while the placement of the title below kept the white elements in a tight group rather than sprinkling it across the boards, lessening its impact.